Flaunt your beautiful curves with this pullover from Marie Claire. Fashioned using acrylic fabric, this full sleeves pullover will not fail to catch your fancy at a single glance. 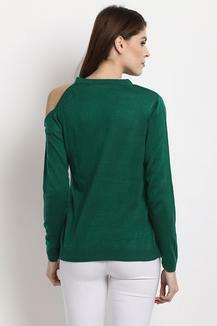 Featuring a round neck and embellished pattern, this pullover holds a superlative enticement. Construct an easy-going look in this pullover. Show off your fashion sense by clubbing this pullover with a pair of contrast denims.